I will post more pictures and information as these projects are completed....Please check back soon as this website is updated frequently. Thank You! 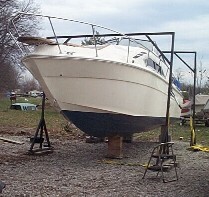 Pictured here is a boat lift. Approx 24 feet long and 11 feet wide. Premium "Dockside" fabric, 1" nylon strap, and subrella facing trim. Nylon straps sewn onto the cover with brass gromets, 5/8 bungee, and spring hooks secure the cover to the frame. 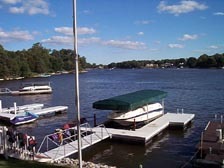 Please call for pricing on your boat lift. Design and location will determine overall cost. 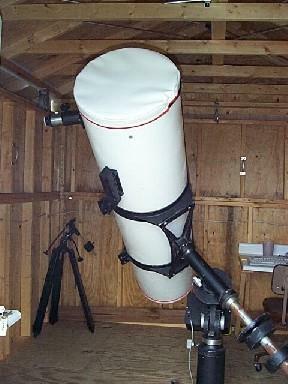 This example was $850.00 installed. The blue one in the pic behind it cost................ $1,600.00!!!!!!!!!!!!!!! 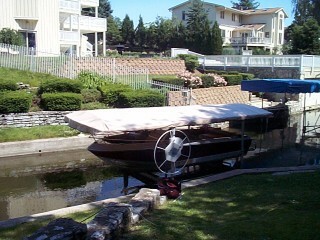 Here is another boat lift. 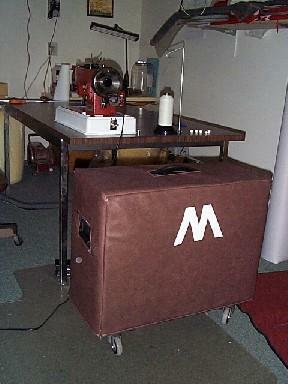 The fabric panel ended up nearly 30 feet long and 14 feet wide. Premium "Dockside" fabric, 1" nylon strap, and subrella facing trim. 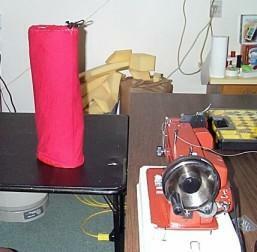 Nylon straps sewn onto the cover with brass gromets, 5/8 bungee, and spring hooks secure the cover to the frame. This example was $1000.00 installed. Bow rail addition to a 2004 Baja. Customer requested similar imitation to larger Bajas that come from the factory with one. Stainless rail with chrome plated bronze fittings. The new rail helps make docking more secure by providing sure footing on an otherwise slick deck. Check out the restoration of this classic on its own page. The carpet and main cockpit flooring were tired and in need of replacement. 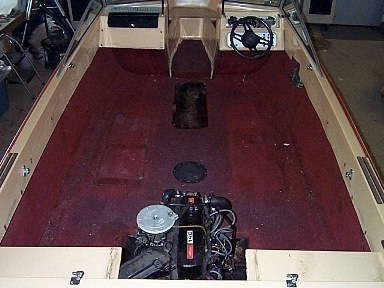 The entire boat was dissassembled and then reassembled using upgraded marine carpet. 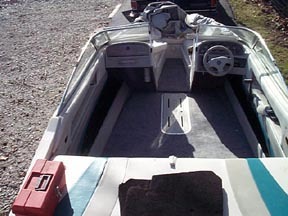 Other modifications included enlarging the locker opening for the fishing poles, the creation of a new step just forward of the helm station, and larger 3" pedestals/seats. 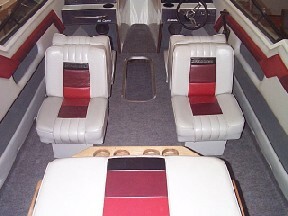 This boat also treated to a new travel cover and upholstery. 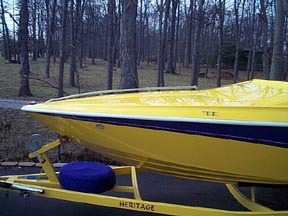 1984 Chris Craft Scorpion 168. 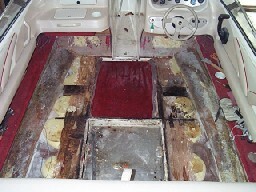 This boat required the old floor to be removed and a new floor installed as part of a total refit. Polyester resin coated on all six sides of each piece of plywood used. 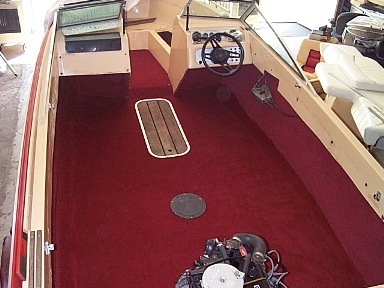 Premium rubber backed marine carpet installed on the cockpit floor and inwalls. 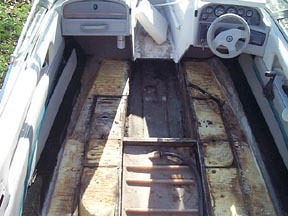 Pictured here is a 1996 19' Caravelle cockpit floor. The old floor was soft around the ski locker and customer chose to replace the entire cockpit floor. The old floor was carefully cut out and the floatation was allowed to completely air out before installation of new flooring. 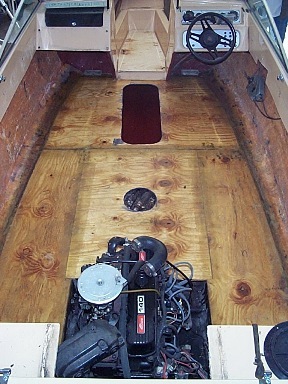 New marine plywood was coated with fiberglass resin on the underside before installation. Three layers of woven glass fabric were applied around perimeter. Each layer wetted with marine epoxy resin. One layer of woven glass was applied and resin coated on the rest of the floor. 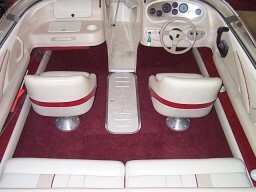 Here is the finished floor with new marine carpet installed. 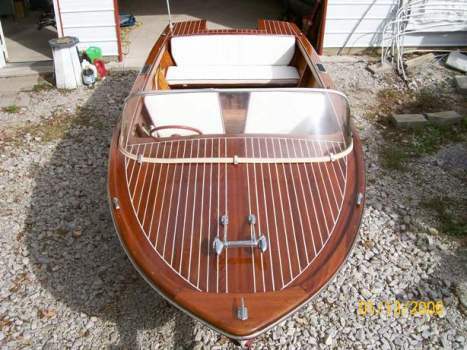 This boat is actually better than brand new as some of the old floor decking was not fiberglassed on the underside. Another floor replacement. This time in a 1996 Monterey. Many times we discover a weakness with the original design and add components reducing premature failure. 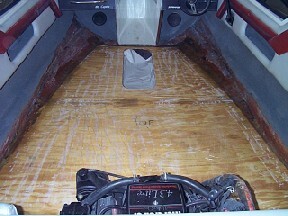 For example, alot of boat manufactures do not add fiberglassed supporting beams on each side of the ski locker under the floor. We do. New floor is constructed with premium materials and looks better than factory. 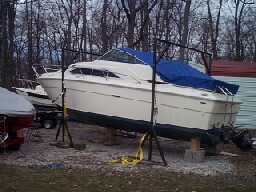 A 1989 Rinker Captiva 186. Floor replacement, start to finish. 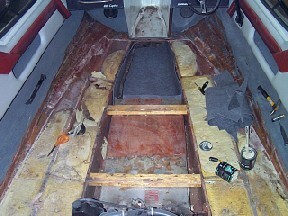 The original floor was getting soft around the ski locker on the port side. 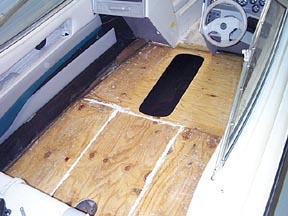 This boats new floor is good for another 20 years! 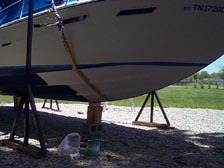 This 2005 blue and white hulled Chaparral 256SSi received two coats of Vivid white antifouling paint. The color was such a close match you cannot tell it has bottom paint from 6 feet away! The bottom should stay clean for up to 4 years depending on water quality. 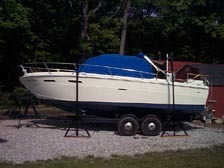 Compare the cost to renting/buying a boat lift. 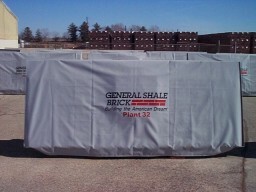 Custom covers for "General Shale Brick" company. 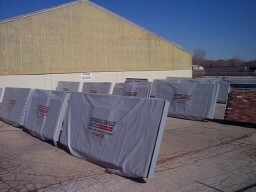 Covers are made from heavy, agricultural grade, vinyl coated polyester. Heavy duty brass gromets, top and bottom. These covers should last seven to ten years. Special two color ink imprinting included. I can have a custom one or two color logo imprinted on your cover for approx. $75.00 to $90.00. Size can be up to four feet by four feet! This would look awesome on your mooring cover, bimini, etc. 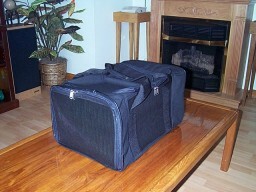 This, not very good picture, is an example of a storage bag that I provide with boat covers and enclosures. Made of canvas and/or left over cover material. Closure type - drawstring, snap, velcro, or any combination. Here is another custom cover (bag). 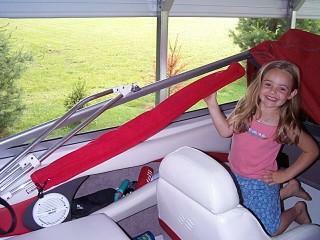 This one covers the folded, partially disassembled support rod ends of a bimini convertible top. 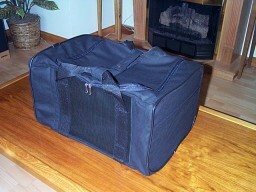 This is a custom made airline carry-on pet travel bag. Made from heavy canvas duck. Spring wire piping sewn in. This allows the bag to compress for sliding under the seat. Heavy plastic mesh so the pet can see and breath on three sides. Zippered top and end. Both entries with two zip pulls. 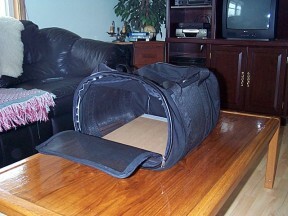 Other end has a large pocket for leash and handle storage. 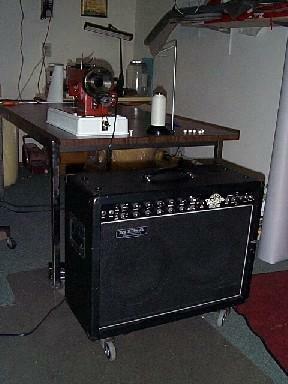 Pictured is a cover I made for a friends guitar amplifier. 3/8 sheet foam sandwiched between heavy marine vinyl and heavy cotton fabric backing. Monogram from heavy white marine vinyl. The closest thing available at retail was over $100.00 and not nearly as well constructed! Another unique project requiring quality covers. 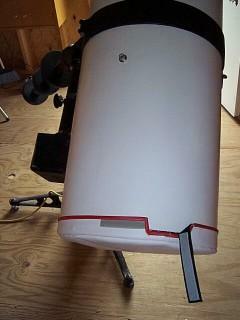 No dust, insects or other debris falling on the optics of this expensive telescope! 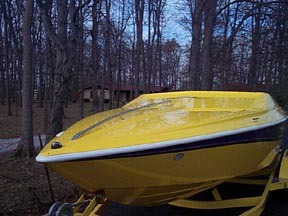 Heavy marine vinyl trimmed in Aqualon. Nylon backed velcro fastener allowing cover to be cinched tight.